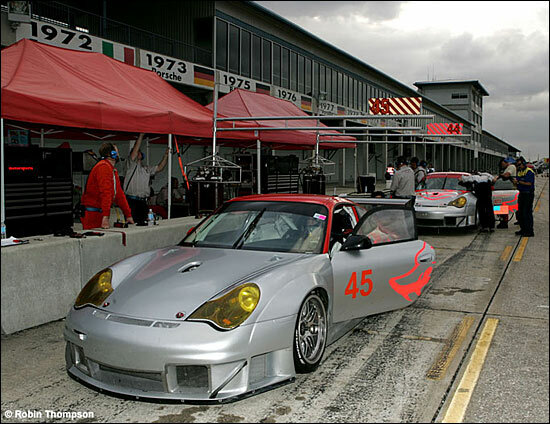 Now here’s a fascinating piece of news: having had the Flying Lizard Motorsports #45 entry for Sebring sat there for several weeks as Johannes van Overbeek / Jon Fogarty / TBA, suddenly the TBA spot is filled by none other than Marc Lieb (2005 LMES Champion, 2005 FIA GT2 Champion and 2005 GT2 winner at Le Mans). #44 has always been down to be driven by Seth Neiman, Lonnie Pechnik and Darren Law. "After running against the Lizards at Le Mans last year, I was impressed by their commitment and attention to detail; it certainly showed in their podium finish,” said Marc Lieb. “This will be my fourth Sebring race and I'm excited to get a chance to drive with Johannes and Jon. It will be our first time driving together, but we have complementary driving styles and I think we'll make a great team." This will be the first ALMS race in which a Porsche factory driver has joined the Lizard squad. Crew Chief Tommy Sadler reckons that "this is an extremely important race, both in points and in setting the pace and tone for the year." The admirable Lizards have certainly set out their marker for the 2006 season. Time to adjust your selections, dsc team? Sorry – too late.